Time to go. We're on the motorway one last time, speeding toward the airport. I wish we'd get stuck in a traffic jam. My eyes are greedy to see more. But no, it's too early in the day for traffic jams. We're traveling too fast to see the squalor. The closer we get to the airport, the better the houses look. Signs in English advertise further housing developments. Why are the signs in English, I wonder, in a country where everybody speaks Arabic? The answer is right there. Of course! It's the language of elitism these days. The Latin of the the 21st century. English excludes all the undesirables - the uneducated, the poor, those who have to live in the rubble. But there's no Mohammed to ask if my hunch is correct. At the airport, we have to go through emigration. We fill in our forms, apparently this time for permission to leave the country. My turn. The officer is a woman! She looks carefully at my form, at my passport. "Noreen," she says. "Nour. You have Egyptian name." She keeps the form and hands the passport back, smiling. Mohammed has already told me that my name is Egyptian and means "Shining Light". With compliments like that, no wonder I love this country so much! We browse one last time in an Egyptian shop, and then head for the gate, where we meet some of the others from our group. I discover that Astrid's seat on the plane is next to mine. We chat during the flight as we eat vaguely Egyptian food. Then I watch an Egyptian sit-com without the sound. "It's a nice thing to do as a language teacher," I tell her. "I was recently at a workshop where we learned about using TV shows as an educational medium. One person listened while the other had no earphones. The one listening had to explain to the other what was going on. Or - you can turn the sound off, like me now, and guess what's happening." "I'll have to remember that," she says. Try it yourself. Here's a link to a show similar to what we saw. The flight takes about four hours. Just as we're about to land, the rudders are already out, the plane suddenly swoops back into the air. What the hell is this?! Are we going back to Egypt? Have we been hijacked? Hella, the one who's been to Africa so many times, thinks something has gone wrong during the landing process, that the pilot cut it too short and had to abruptly ascend. Whatever. We circle Frankfurt once, and touch down. An unbelievably smooth landing. We inch through the plane with the rest of the passengers, several of them loaded down with Egyptian memorabilia. We thank the crew members, one by one. Now we're at the cockpit, just about to leave the plane. "Shukran" I say to the last member of the crew and, much to my surprise, my eyes well up with tears. I walk through the gate, tears spilling down my face. I wipe my eyes. "I can't say shukran anymore." He takes my hand and we walk together to collect our luggage. Note: This concludes the narrative part of my series, "Shukran" means "Thank you". Up to this point, the members of my writing group reading this will probably be pleased with what I've written. I have done what the books say you're supposed to do. 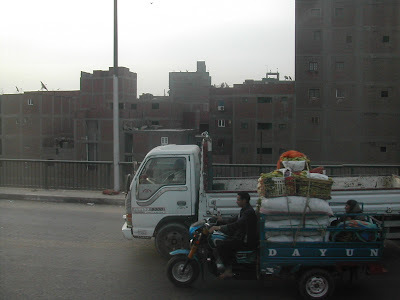 I've shown you what I saw, what I experienced in Egypt, without too much clarification or comment. How many times have I heard Sharon say, "Show - don't tell!" But when I went to school, we had "Show AND Tell", and I loved both parts. Besides, part of traveling is also unpacking the suitcase and looking again at all the things you've brought back. I want to tell you more about how this trip changed me. If you're content with what you've already read and want to stop here, go ahead. If you want more, read the next post. I'll be unpacking my suitcase.